It looks as though the piece of Ferrari that he has left is worth rather less tha a million dollars! Stefan Eriksson is now in jail in Sweden because of his involvement in organized crime. We can all hope he learned his lesson. 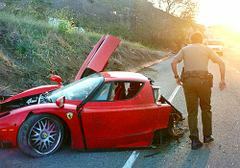 He nearly killed someone and, by the looks of it, he barely survived after his Ferrari was literally sawed in half. There goes your insurance. That's a pretty shallow lie, if you ask me. Erikson was convicted of many felonies including involvement in organized crime. He should be thankful that he survived that very serious crash. I hope he learns his lesson. And while he is in jail, he can make amends for all his bad deeds.